Until now. Excitingly, I have discovered a way of making a stew which only taken 30 minutes. And, unlike Jamie Oliver's '30 minute meals', where you need a sous chef to have prepared and chopped everything beforehand plus a shiny TV kitchen and cameras to make it look amazing, this actually only did take 30 minutes, from start to finish. So there. This recipe will serve 4 people, or 2 hungry people with leftovers for lunch. It's got quite a chili kick to it so if you would rather, leave the chili out! 1. Roughly chop 1 onion, 4 rashers of bacon, 2 cloves of garlic and a chili, and saute in olive oil for 3 minutes with a tsp each of cumin, smoked paprika and cayenne pepper. 2. Chop a celeriac into bite-sized pieces. Add to the mixture and cook for another 3 minutes. 3. Chop 3 big tomatoes and add to the mixture. Give them a minute to warm up, and then add a tin of kidney beans plus the water they are in. 4. Add 1/2 a litre of hot water, season generously and cook for 15 minutes, stirring occasionally. Don't worry if it looks a bit too watery, you'll need it for the cabbage at the end. 5. Pan-fry (or grill if you're being healthy) 1 pork chop per person - it should take around 5 minutes on each side. Pork is cooked when it's white and the juice runs clear. I wasn't being healthy so seasoned liberally and pan-fried mine in butter on a medium heat, with a stick of fresh rosemary thrown in. The rosemary infuses into the butter so that when you turn the chops over, they are cooking in herby butter. YUM. 6. 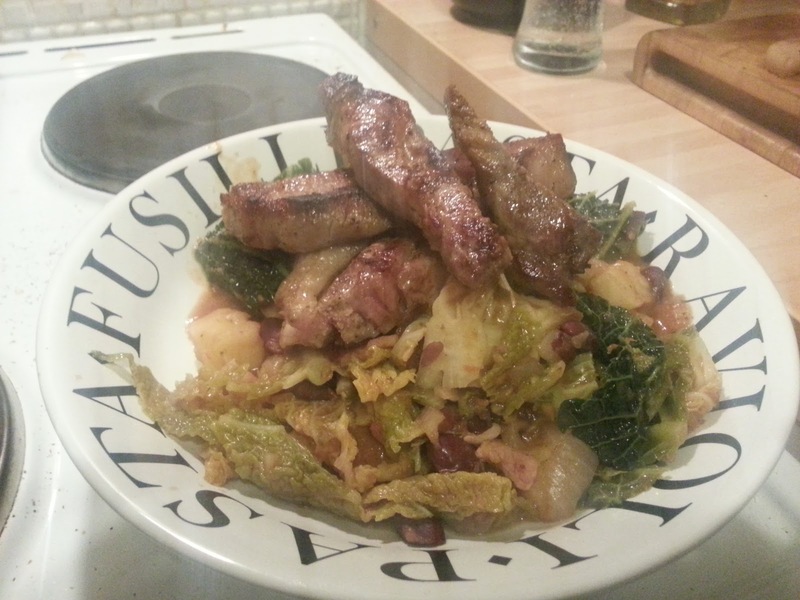 Chop half a savoy cabbage into thin strips and add to the stew for the final 5 minutes.